Publication Data: The first edition of this novel is from Collins Crime Club (UK), 1930, and an early US edition is from 1931. 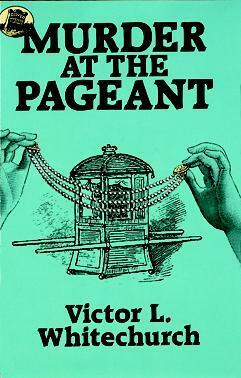 There were a couple of early reprint editions; then the book went out of print, as near as I can tell, until the mid-80s, when Dover did a reprint (my understanding is that Dover would only reprint mysteries if they were in the public domain or very, very inexpensive) and Greenhill Books also did a small-format hardcover, pictured nearby. As far as I know, there has never been a mass market paperback edition. Spoiler warning: What you are about to read will discuss the solution to this murder mystery in general terms and it will certainly give away large chunks of information about its plot and characters. Please read no further if you wish to preserve your ignorance of its details. You will also probably find here discussions of the content of other murder mysteries, perhaps by other authors, and a similar warning should apply. Sir Harry Lynwood is the Lord of Frimley Manor and has agreed to a kind of aristocratic party game. He and his many houseguests don expensive costumes and re-enact a visit from Queen Anne to Frimley Manor in 1705. Mrs. Cresswell plays the Queen and her well-known necklace of enormous pearls plays a great role in the re-enactment, which also involves “the Queen” being carried in an antique sedan chair from the front gage of the estate to the steps of the Manor. The house party (and a sprinkling of upper-class locals) enjoys itself immensely, dines and retires. But in the middle of the night, two people are seen to be carrying off a dying man in the sedan chair. They flee when discovered; the man in the sedan chair gasps out the words “The … line …” and dies in the arms of Captain Roger Bristow, who used to be with the Secret Service and apparently specializes in solving mysteries. (To the best of my limited knowledge, this is his only appearance.) Captain Bristow soon combines his talents with the considerable investigative abilities of Superintendent Kinch to take on the twin crimes of the unidentified dead man and the theft of Mrs. Cresswell’s necklace. The investigative team proceeds in a fairly straight-line way to dig into the crime, pick up tiny clues like a scrap of gold lace and the contents of the side pockets of a stolen and abandoned car, interview and re-interview witnesses, and bring the crime home to the criminals. There are not really any false trails or red herrings, although there are certainly a couple of people who begin the story as suspects and end it exonerated. The investigators continue to narrow the circumstances of the crime such that only one person who was legitimately in the house that night can have been responsible for a good part of the criminal activity. That person is accused and becomes determined to confess everything in order to get revenge on the other guilty party, and that person’s identity and complicity in the crimes. The dying man’s final utterance turns out to have been significant to solving the crime but not determinative of its answer — in other words, if the dead man’s speech had been completely understood, half the crime might have been solved but not all of it. The final lines of the book reveal that an assumption under which the investigators have been labouring is, amusingly, not quite what they thought it to be — but the crimes are solved and everyone is happy. I’ll suggest that this early example of the Golden Age mystery is certainly worth your time, mostly because it has a considerable amount of what I can only call “charm”. It is gentle and subtle; all the violence is off-stage, and the investigators are courteous and polite to the suspects. It is, in fact, in an old-fashioned way, “gentlemanly”. This is a book written by an old-fashioned gentleman for an audience of old-fashioned gentlefolk, with nothing untoward, nothing really unpleasant, and the social order is restored in the end. I have to admit that, as I was reading it, I kept thinking, okay, surely something is going to happen. But — no. The modern reader will be surprised to find that there are no false trails. There are not two criminals working at cross-purposes to commit different crimes; there is no innocent party who has his or her own agenda and who is muddling the trail. No red herrings, no false clues, no embarrassing little secret that an innocent party is working to conceal. Nothing of what I call the “B-plot”. In fact the gentry kind of hang around and wait to be questioned, more or less; they don’t do much when they’re not in the library being asked polite questions by a polite investigator. All we see is chapter after chapter of the investigators looking into a particular clue and making arrangements to investigate it in more depth. The modern reader will also be surprised to find that there is very little in the way of characterization in this novel. The author does not try to work on our feelings by unjustly accusing an obviously innocent person. Well — okay, just a little. The Vicar’s scapegrace nephew and a young woman staying in the house are both suspected. The young woman immediately leaves the reader’s consciousness as a potential suspect; first, because the author has not troubled to give her any kind of distinct personality, and second, because the investigators so obviously do not believe she is guilty. They must consider her guilt because it’s their job to do so, but you can tell they don’t believe that a “nice” upper-class girl such as Sonia could have done anything criminal in the slightest. And for some reason the Vicar’s nephew falls into the same category; we learn that although he has been rascally in the past, he has turned over a new leaf and was in the process of doing so the night he borrowed the Vicar’s car without permission. But it is just as clear that they have not really suspected him. In fact, all the criminals come from the servant classes and their associates. This will come as something of a surprise to the devotee of the country house mystery, who is accustomed to upper-class matrons or retired colonels who commit desperate crimes because of an early unsuitable marriage or enormous “bridge debts”, but in this case, since the house party’s members merely stand around and wait for the investigation to be over, it’s clear to the reader that we must look elsewhere for the guilty party. The only person who actually has a distinct personality is Mrs. Cresswell, the owner of the stolen pearls, who is depicted as someone by whom others are amused; she is vain and takes every opportunity to show off her heirloom necklace. The investigators consider the possibility that Mrs. Cresswell has done something for the insurance money, etc., but they just can’t accept it (to be fair, there are motivations portrayed in the book for it to not be unreasonable; they are family heirlooms, etc.). The dead man actually does sound like he might have been an interesting character, a kind of shady but upper-class private investigator, but we don’t really get a chance to see him in action. Dead, you know. And devotees of the country house mystery are a bit baffled at about the one-third point of the novel because they are being given no one at whom to look — no one to suspect because she’s obvious — no one to suspect because he’s not obvious. Everyone in this book is pretty much what they seem to be. Essentially this is a murder in the course of a theft perpetrated by professional criminals, some of whom are masquerading as servants. And this was published in 1930, which may have been the last point at which the reading public would have been prepared to accept this solution. This book was published two years after S. S. Van Dine had published “Twenty rules for writing detective stories”, and one of those rules was #17, “A professional criminal must never be shouldered with the guilt of a crime in a detective story.” Admittedly Van Dine’s rule was addressed to the interaction of amateur detectives with amateur criminals; police officers could investigate professional criminals. 1930, though, is the very tail end of the public’s willingness to accept this as part of a puzzle mystery. In the literary realm of the “don’s delight”, the upper classes don’t really want to read about crimes committed by the servants, even if they are detected and punished. I can certainly understand the suggestion that Whitechurch’s work would be very much in the realm of Freeman Wills Crofts. It’s reasonable to look at both these writers as being precursors of the police procedural; and these gentlemen frequently had professional criminals as their antagonists, whereas other writers had moved on to retired colonels with bridge debts, as it were. But there is a difference between Whitechurch’s style and Crofts’s, and it took me a while to see it. Crofts’ novels are interesting because Inspector French starts investigating a case by investigating the people; he interviews them at length, investigates their movements and activities, their personalities and households and associates. Yes, he investigates clues, but his style of mystery-solving involves consideration of various suspects and whether the clues fit them (and whether their alibis hold up). Whitechurch, on the other hand, doesn’t really have any suspects, only characters standing around. His police officers focus on clues; where they come from, their meaning, their implications. The police do police work like tracing down cars by their license plate numbers (there’s a charming moment where a senior policeman opines that two digits and four letters may not allow enough possible license plates for the huge increase in the number of autos on the road, the unspoken bit being that now automobiles are within the financial reach of upper middle-class people). They ask people questions, but it’s a little weird; it’s as if upper-class people weren’t allowed to lie, so the police just accept everything they say and try to find another way to make the clues reveal the criminal. 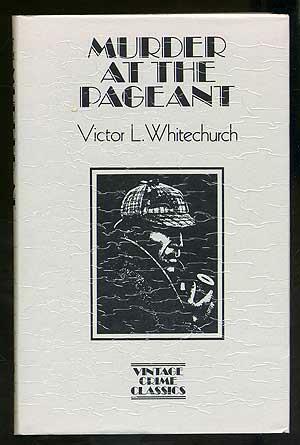 My research into Whitechurch indicated that he took great trouble to make sure that his books were accurate in the realm of how the police were represented; he went so far as to submit his works to Scotland Yard to ensure that everything was accurate. I actually did think it was interesting to learn how a police officer in the 1930s would have gone about looking for license plates that had been thrown into an unspecific ditch; what resources they would call upon, how they would plan, etc. But some of it seemed to me like a display of investigative technique without much actual relevance to the case they were solving. And some of the investigative technique misses the mark completely. The actual location of the pearls, for instance, is such that it’s just ridiculous that the investigators missed it. That’s because the pearls are needed for a “big reveal” at the end of the book — and heaven knows something is required, since the criminals are desperately anxious to reveal the entire criminal plot in great detail and don’t require much prompting once they’re caught. The discovery of the pearls, in fact, disposes of the only red herring that I had noticed that was not mentioned by the writer with any emphasis. Mrs. Cresswell’s husband is said to be fiercely protective of the pearls, restricting his wife from wearing them except upon ceremonial occasions and hiring detectives to protect them. However, he seems strangely uncaring about the pearls when they are stolen, and of course I immediately suspected that he may have had a hand in stealing them. On the last page of the book Mr. Cresswell reveals that the pearls in fact were replaced by him by paste copies, long before the theft, and he doesn’t care because they’re worthless. And the detectives share a little chuckle about how credulous Mrs. Cresswell has been. And honestly, don’t you think the police would have found that out a long, long time ago? So the focus on clues is only upon clues where the investigators can display policing skills that move the plot forward a little, but not actually solve the case or anything. Crofts was the better writer because his focus on alibis kept the focus of the novel upon people, and it created a kind of breaking point in each novel. When French managed to discover exactly how the criminal had faked his alibi, bang! the book was at its climax and the criminal was immediately arrested. 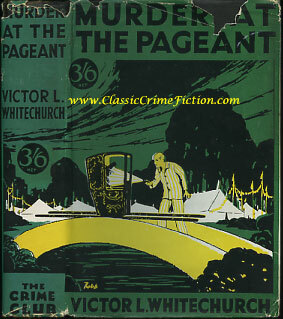 Whitechurch’s focus upon clues means that, at the three-quarter point of the novel, midpoint of act III, the police realize exactly what has happened with the theft and murder, but the people concerned — the professional criminals — have to explain out loud why things happened the way they did, or else it wouldn’t make any sense to the reader or the police. In fact, in this novel, one of the principal criminals is entirely off-stage until after the climax of the novel. Admittedly this is well foreshadowed in the earlier material, but it is very strange to the modern reader, who is accustomed to the shock of surprise at learning that the kindly old retired Colonel, who has been being a nice person in the background throughout the novel, has actually been desperate for money and committing criminal acts. Here, Whitechurch introduces us to the second person who was carrying the body in the sedan chair when he is shot by his accomplice on page 243. And really, I couldn’t tell you what his name is or what he looks like. I knew he had to exist, it’s just that he’s not really in the book. I think this was an acceptable story-telling method at the time, since people hadn’t really been writing detective stories long enough to know what worked and what didn’t. But I think it’s one of the reasons why Crofts has remained somewhat in print and Whitechurch has not. In fact, on page 175 of my copy, one of the principals sits down and makes a list of people’s names so that he can hold them up against the facts one by one, if his instinct is true and the lovely Sonia is completely innocent, as everyone seems to assume. In a Freeman Wills Crofts novel, this might have been a hundred pages earlier; Inspector French needed a list of people so they could start investigating alibis. Crofts’ stories are quite complex; this is an easy straight line from start to finish; the police tell you everything they’re thinking as they go along, and they’re not all that brilliant. So if you want to experience a kind of simple, entry-level detective story, with nothing too taxing and nothing hidden from you, this may well be a book you’ll want to pick up. I got a good deal of enjoyment from it, some of which was for reasons that had nothing to do with the plot. For one thing, my copy (from Greenhill Books, see below) was apparently reprinted by copying the actual pages of the first edition, and so I took a great deal of pleasure in the antique typography that you can easily tell was done with hot metal type on a Linotype. I’m funny that way; modern kerning pairs are fine, but there’s something naive and charming about hand-set type. It was a constant delight to my eye. Similarly the intricacies of merging a semi-colon into a double em dash … well, perhaps you won’t enjoy that as much as I did. But the antique standards of punctuation are there for you to enjoy if you can. The other reason I enjoyed this is that it is the kind of book that modern-day readers think is the antecedent of the cozy. As I’ve said above, I think it’s more like the antecedent of the police procedural, but there’s just something about this book that is charming — it’s so gosh-darned nice. It’s nice that everyone respects police officers; it’s nice that people tell them the truth and try to help them. It’s nice that the investigators are old-fashioned upper-class gentlemen, investigating crimes among a group of people whose idea of a good time is renting an expensive costume and partying like it’s 1705. No one does anything immoral, no one is unkind or rude, and the most troubled person in sight is one whose vanity has made her a mild figure of fun. I truly think the modern cozy is quite a bit different from this; the modern cozy is more likely to rip the lid off a cesspool of suburban sin and crime. This is more like a police procedural against a background where everyone loves and trusts the police. Certainly a bygone era, but one that it’s pleasant to visit. P.S. : I have to acknowledge that I received this handsome volume as a prize in a contest from my friend John, proprietor of an excellent blog at Pretty Sinister Books. I answered a bunch of difficult questions about children in the Sherlockian canon and this book was the result. Thanks, John! 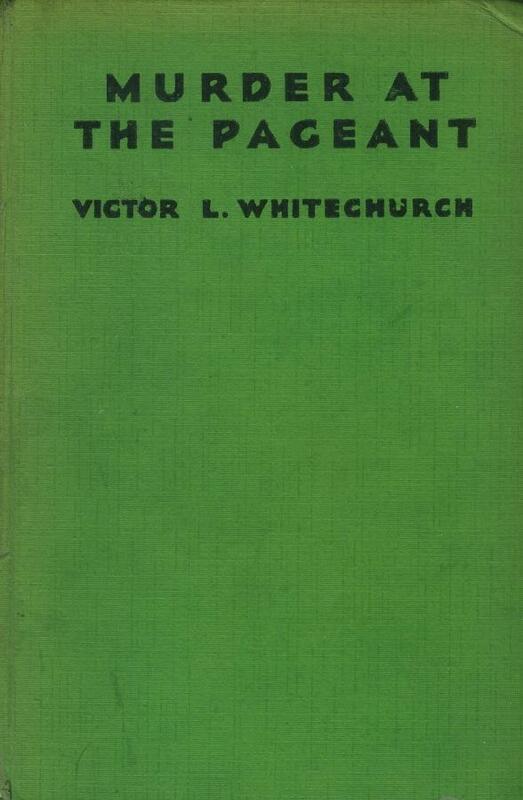 As near as I can discern from booksellers on the Internet, the first edition is green cloth and the “cheap edition”, later the same year, is in black (and a further edition in 1933 is blue). 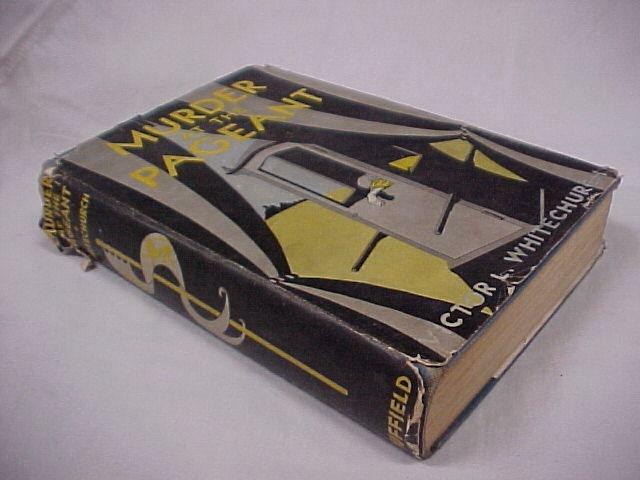 The first US edition is Duffield, 1931; an American Dover trade paper edition exists from 1987, and the edition shown at the head of this post is the attractive edition from Greenhill Books, 1985 (its “Vintage Crime Classics” line) that I read for the purposes of this post. It is a smaller-format hardcover; one dealer remarks plaintively that there is “heavy rippling to the laminate coating on the dust jacket” but I actually believe this is deliberate and decorative (or at least unavoidable); I found it gave the book an interesting texture. It’s hard to say what a first in jacket would cost, since I couldn’t find one for sale. A first edition without jacket is about US$50. A first US from 1931, VG in a worn DJ, is about US$300 and this might indicate that a VG first in VG jacket would be perhaps $500. A nice copy of the first US without jacket is about $25. If you merely want a reading copy, I’d pick up a secondhand copy of the Dover trade edition; it might not be pretty but it was made to last and it will hold its value. The Greenhill Books edition is more attractive but also more expensive; probably meant for libraries or collectors. I am indebted to the folks at ClassicCrimeFiction.com for the ability to show you what the first edition jacket looks like, the deep green with the strong yellow accents; I acknowledge that the illustration of the jacket is theirs, and it’s the only one on the internet so I am showing it to you for scholarly purposes. Classic Crime Fiction are among the world’s most accomplished dealers in vintage detective fiction, especially British editions, and if anyone is ever going to have a crisp first edition of this volume available, it’s probably going to be them. I recommend you bookmark their site and check in every once in a while. This 1930 volume qualifies as a Golden Age mystery; fourth under “O”, “Read a book by an author you’d never read before.” Ordinarily this would be difficult; I’ve tried at least one of every author you’ve ever heard of, as best I could, over a long career concerned with mysteries. However, I’ve had a close look at Canon Whitechurch’s output and to the best of my knowledge, I’ve never read any of his books before; if I have, I certainly don’t remember it. I remember having a facsimile edition of Thrilling Stories of the Railway pass through my hands but I don’t think I found it sufficiently interesting to plough through. For a chart outlining my progress, see the end of this post. 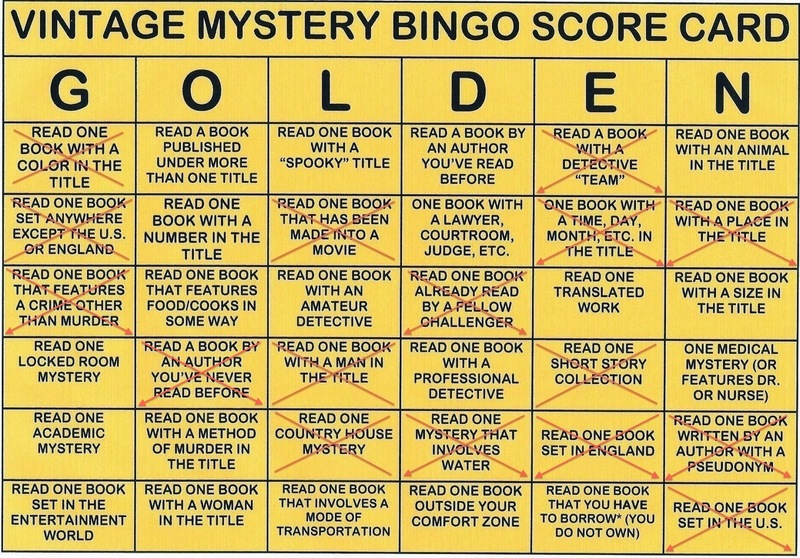 This entry was posted in 2014 Vintage Mystery Bingo, Detective fiction, Golden Age of Detective Fiction, Mystery, Mystery writers, Novel and tagged Canon Whitechurch, Ellery Queen, Freeman Wills Crofts, Inspector French, Queen's Cornerstone, Victor L. Whitechurch. I had much the same reaction to Whitechurch and this novel specifically (Barzun and Taylor are rather high on Whitechurch). I just found his books too genteel and mild to be of much interest as detective novels. There’s another clerical British mystery writer from the period who is rather similar, the one who wrote the Inspector Frost mysteries. Coupled with the Ronald Knox mysteries, which are better but still rather mild affairs, it makes me wonder whether the typical mystery-inclined British cleric was really up to the job of writing about crime. A detective novel where everyone is rather nice (except the professional criminals) is operating under severe limitations, I think. Amazing how much better the Father Brown tales, with an actual cleric detective, are. “Genteel and mild” is a good way of putting it. I agree that the ones by Monseigneur Knox are the same but they at least have the virtue of being difficult puzzles. I’m not sure I know who you mean by “Inspector Frost” … not the television series Frost, I imagine. Oh, no, the seven 1920s/30s mysteries by H. Maynard Smith, an Anglican minister.